The Steelers opened up the game with a 43 yard screen pass to Sammie Coates. Two rushes by Le'Veon Bell and a a completion only gain 9 yards, which forced the Steelers to kick a 39 yard field goal on their opening drive. Pittsburgh's defense forced a quick three and out. After picking up a first down on Antonio Brown's first catch of the game, Eric Berry knocked down a sideline pass on 3rd down to force the Steelers to punt to Tyreek Hill. However, Steelers punter Jordan Berry pinned the Chiefs back at their own 5 yard line. After a play action pass to Travis Kelce set up the Chiefs 3rd and 1, Spencer Ware busted one up the middle for a big gain that was called back on a holding. This time, Kelce caught a 12 yard pass on a quick out with 3 WRs lined up on the opposite side of the field for the first down. Kelce caught his 3rd pass on the drive for another first down to move the chains. However, on 3rd down, Alex Smith hit Chris Conley just a yard short of the first down marker on a curl route. The first quarter ended with the Steelers up 3-0 and Pittsburgh punting from their own 15 yard line to begin the 2nd. The Chiefs would have great field position at their own 46. Kansas City wouldn't get much going on their possession, despite a first down catch from Jeremy Maclin. With the ball spotted on the Steelers 36, Smith was forced to run out of bounds for no gain and followed that up by throwing the ball away on third down. Andy Reid decided to attempt a 53 yard field goal and Cairo Santos knocked it down from the left hash. On 2nd down, Ben Roethlisberger saw Sammie Coates in one on one coverage against Marcus Peters and decided to challenge him. Peters won that battle and came away with an interception. Chiefs started from their own 30. Kansas City came out and ran a pitch right that Spencer Ware took for 21 yards. Next play, Alex Smith was looking for Kelce on a play action pass, but Mike Mitchell jumped the route and took it to the house for a pick six. Kansas City would move the ball to midfield, but was forced to punt the ball back to the Steelers with 2 minutes remaining. Bell was able to find a hole, waiting patiently behind his offensive line, picking up 15 yards. An encroachment penalty by Chris Jones, on first down, moved the Steelers inside the red zone with 45 seconds remaining. Bell would pick up 12 yards on a draw play to set up first and goal from the Chiefs 5. The Chiefs defense would hold them to just a field goal and the Steelers went into the locker room at halftime up 13-3. On the first possession of the half, Kansas City picked up 25 yards on a Tyreek Hill reception to move them to their own 45. Javon Hargrave would come up with a big 3rd down sack to force a punt. Dustin Colquitt pinned the Steelers back at their own 8. Roethlisberger found Brown in one on one with Steven Nelson, who was playing 10 yards off Antonio, and he got beat on an out route that Brown took 47 yards down the sideline. Bell followed that up with an 11 yard run to the left. On 3rd and 9, Brown caught a 22 yard pass down the middle of the field to set up 1st and goal from the Chiefs 8. Brown would catch his 3rd pass on the drive, a slant route that increased the Steelers lead to 17. 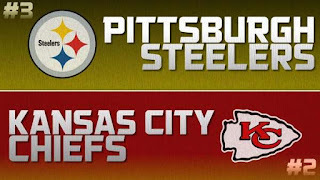 The Chiefs were driving, but the 3rd quarter came to an end with the score Pittsburgh 20, Kansas City 3. KC would get to the Steelers 21 yard line, but were forced to go for it on fourth down and failed to convert. Kansas City did a good job to force a punt, but with time running out, they were going to have to get aggressive on offense. However, Spencer Ware fumbled the ball while taking a big hit from Ryan Shazier and William Gay jumped on it to recover the ball for Pittsburgh. Chris Boswell would knock down his 2nd field goal of the game, this time from 46 yards out, to give the Steelers a 20 point lead with time running out in the fourth quarter. Alex Smith drove the Chiefs down the field with two first down passes to Spencer Ware, a 10 yard completion to Tyreek Hill and a 15 yard penalty on the Steelers for unnecessary roughness. Travis Kelce would catch two passes on the drive, one for just 5 yards and the other a touchdown. The Chiefs now trail 23-10 with one time out and less than two minutes remaining in the game. After a Le'Veon Bell first down run, Roethlisberger took a knee and the Steelers walked out of Arrowhead victorious, heading to the AFC Championship.